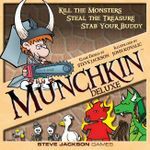 Munchkin Deluxe includes the Munchkin base game, along with a game board on which players can organize their cards, six colored pawns so that players can track their current character level on said game board, and six player cards so everyone knows who is which color and what their current gender is. Important details to keep track of! More information, including nifty pictures, is available at the official web page.